But the evening post brought Roger one last fatal scrap of information. 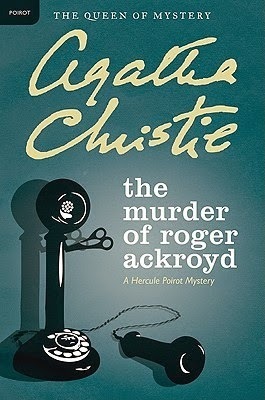 This is the second Poirot story that I’ve read and I think I’m starting to understand them a little more now. When I read The Mysterious Affair at Styles (and reviewed it here), I was annoyed because the narrator, Captain Hastings, kept belitting Poirot and being smug despite being quite the idiot. This time around, Dr Sheppard is in charge of relaying events and he was much less irritating than his predecessor. Maybe because he didn’t spend most of the book deriding a man who is quite clearly his intellectual superior. All of which means I’ve done a bit of u-turn and decided that I quite enjoy seeing the enigmatic Poirot through the eyes of different characters because it preserves the mystique shrouding the famous detective. The fourth instalment in the Hercule Poirot set of mysteries is set in a very British, small village that is alternately brilliant and annoying. Repressed ageing villagers are nothing if not well-practised at concealing secret despairs and loves from the people that they spend their lives in close proximity to so there are plenty of misunderstandings and revelations scattered throughout the story to occasionally offer a moment of relief from the otherwise slightly twee narrative. There was something that grated on me about the nosy, prying, gossiping characters and for some reason I let that lure me into thinking that I wasn’t really enjoying reading about them. As always, though, much of what I had been taking at face value was not as it seemed and nothing was a wasted detail. There’s a retired elephant hunter, a slightly shifty seeming butler, a swooning young woman, a formidable housekeeper and a victim that had secrets of his own. I made the mistake of thinking that it was business as usual so that you don’t have to. This is a reasonably short book but one that will pay you back in dividends. Having read about it, it seems that the twist in this tale is not widely appreciated and was the source of much controversy at the time. I thought it was brilliant. I like Agatha Christie because I like not quite being able to trust what I’m reading. I don’t read crime fiction (cosy or otherwise) because I want to get to the end and be able to pat myself on the back for guessing a twist or picking out the murderer; I read crime fiction because I want to be kept on my toes and surprised when things are revealed to not be quite what I thought. I don’t feel “tricked” if I’ve followed the red herrings down the wrong road because it just makes the Big Reveal moment all the more fun. The Murder of Roger Ackroyd would have clocked a mediocre 2.5/3 star rating if it hadn’t had an ending that made me gawp. Gawp-inducing endings are winning endings. Fact. Overall: I do recommend The Murder of Roger Ackroyd but only if you trust me. There may well be times when you’re reading it that you think, “This is dull – what was Charlotte thinking in recommending it?” so I only want you to read it on my recommendation if that isn’t going to be your final thought before abandoning reading it entirely. The ending makes everything worth it. Honest.